A hymn on the sacrifice of Christ at Calvary; the Mass as fulfillment of the Old Covenant. 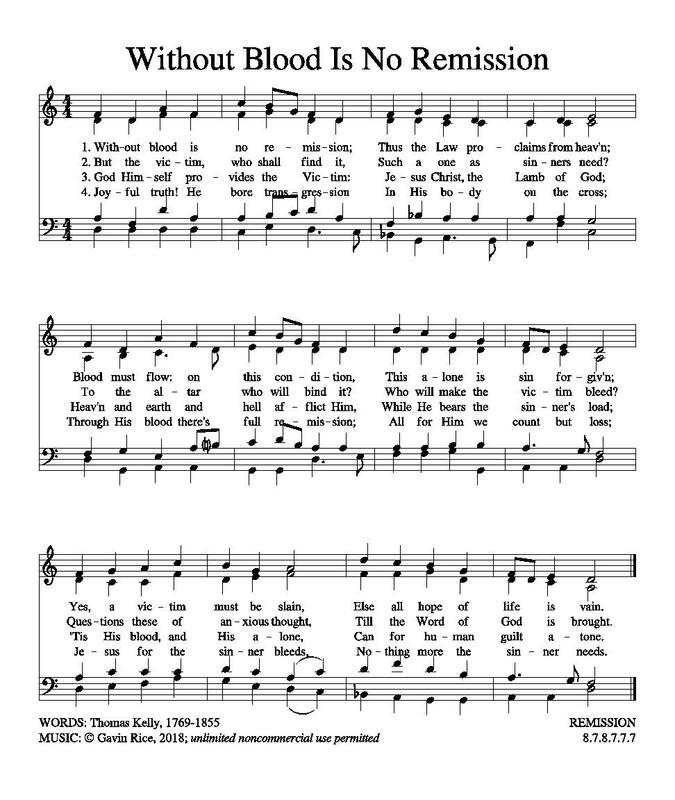 Appropriate for use throughout Lent, on Good Friday, or as a hymn on the Precious Blood. Without blood is no remission; Thus the Law proclaims from heav'n; Blood must flow: on this condition, This alone, is sin forgiv'n; Yes, a victim must be slain, Else all hope of life is vain. But the victim, who shall find it, Such a one as sinners need? To the altar who will bind it? Who will make the victim bleed? Questions these of anxious thought, Till the Word of God is brought. God Himself provides the Victim: Jesus Christ, the Lamb of God; Heav'n and earth and hell afflict Him, While He bears the sinner's load; 'Tis His blood, and His alone, Can for human guilt atone. Joyful truth! He bore transgression In His body on the cross; Through His blood there's full remission; All for Him we count but loss; Jesus for the sinner bleeds, Nothing more the sinner needs. Else all hope of life is vain. Such a one as sinners need? To the altar who will bind it? Who will make the victim bleed? Till the Word of God is brought. Can for human guilt atone. Nothing more the sinner needs.